Got whimsical and did something stupid. Didn’t start out being stupid, but got there quick enough. Keep thinking about tea bags and coffee beans and how the use of those consumer staples might cross over to brewing beer. Tea drinkers know the pleasure of squeezing out the last burst of flavor (love that burst of ink). Miserly coffee drinkers like me hate automatic espresso machines because they don’t allow the user to hit that puck one final time to strain out that last bit of resinous flavor. I don’t like tossing oily pucks into the garbage. In my quest to extract hop flavor, I conducted an experiment in my kitchen. I filled a 14 oz French coffee press with a small handful of US Fuggle whole cones. Slowly poured in about 6 ounces of Fat Tire – real slowly since on contact the beer exploded into a thick, resolute column of foam. The goal was to press the screen down flat against the cones on the bottom. The problem was the plunger on my coffee press didn’t reach the base, leaving about a 1-1.5 inch gap. Had plenty of beer contact with the hops but couldn’t get that one last muscular push. The lightly squeezed hop-infused Fat Tire didn't live up to it's name – it went from fat to flat. It’s like the cones sucked out the alcohol, CO2, malt and flavor, leaving a thin, attenuated and insipid brew that gave off the aroma of wet grass. On the other hand, I took comfort in knowing my hoppinated beverage was loaded with fresh anti-microbials, anti-fungals and anti-stomach bugs. Plus a heavy dose of xanthohumol and quercetin. Plus with all those cannibaccea-related sedatives I did wind up sleeping like a baby buddha. Back to the drawing board. Note to self: not so sure that dropping whole cones into a pint will add much (beyond the aforementioned pharmaceutical stuff) . Fun, and romantic, and certainly a boon to consumer hop education, but not sure it adds anything zesty in the way of flavor. Might even screw up the original flavor. Second note to self: hop oils are generally hydrophobic. The myrcene in Fuggles is 46%. Im seriously doubting the lupulin glans will easily give up their precious oils during a 60 second dunking. I suspect most beer lovers want to put that foamy brew to their lips within about 10 seconds of the pour. I have heard tales of brewers, inspired by the coffee press model, attempting to renovate their fermentation tanks during dry hopping to achieve a similar process. I’ve asked around and so far, nobody’s owned up to it. The idea would be to lower a screen into the tank and press the hops (whole cone or fat pellets) and squeeze out the oil. Of course this may also squeeze out tannins and acids and other undrinkable compounds. It would have to be engineered just right – a removable top, a tight plunger that could easily lower, and a base that would still allow for the fresh squeezed hoppy beer to flow through the bottom. If anyone has any ideas, let me know. To work, we’ll need time, money and crack engineers. Hop Karma doesn’t come instantly. By now I’m sure you’ve heard about changes afoot in the rules regarding the use of hops in certified organic beer. A committee that oversees such things recently voted 6-0 in favor of recommending the removal of hops from the list of organic-exempt ingredients. If adopted, and it likely will be, the rule would not take effect until January 1, 2013. What does this mean? It means that farmers have two seasons within which to begin planting organic crops. It also means that brewers who wish to brew organic beers have time to both contract with growers for particular varieties and, if necessary, begin contemplating suitable substitutions. The Fed Panel acknowledged that the transition wouldn’t be easy as pie. That’s why it didn’t recommend that the rule change be enacted immediately. In setting forth their “roadmap” for a smooth transition, the panel envisioned that if a brewer had a need for a variety that was not commercially available, it could petition to put that specific cultivar on the organic-exempts ingredients list. The Panel made it clear that brewers need to establish (if they haven’t already) a solid relationship with their local accrediting agency on issues relating to the form, quality, and content of available varieties. Likewise, growers and merchants will need to educate their local ACA on the varieties they have available, and be prepared to address form, quality and quantity issues. If you’re already set with organic hops, the rule changes won’t affect you that much, aside from helping bring the price down by encouraging more US hop farmers and merchants to go organic. If you’re currently sporting the USDA organics label, but not using organically grown hops, the change may strike you as an irksome roadblock that forces you to weigh the merits of plotting a new, more authentic course or scrapping the organics trip altogether. At Indie Hops, we’re here to help you get you on the right track. Since 2009, we have committed to growing 20 acres of organic hops at Goschie Farms. We’ve got about 11 acres in the ground (9.4 acres of Cascade and 1.4 acres of Centennial) and our first certified organic crop will be available in 2012. We’re planning to plant the remaining 10 acres this Spring. If you’re currently using Cascade or Centennial, or wish to substitute them in, we’d of course love to be your supplier. If you prefer other varieties, please let us know. Your feedback will help us decide what varieties to plant this Spring. We have a flexible, sustainable and transparent pricing program we’d like to discuss with you. Our goal is to get it right at the farm level so that eventually the yields will go up and the prices will come down, and you’ll be motivated to go full green. As a wiser man once said: Change is real and reality changes. We’re here to help you adjust to a new and we hope better reality. 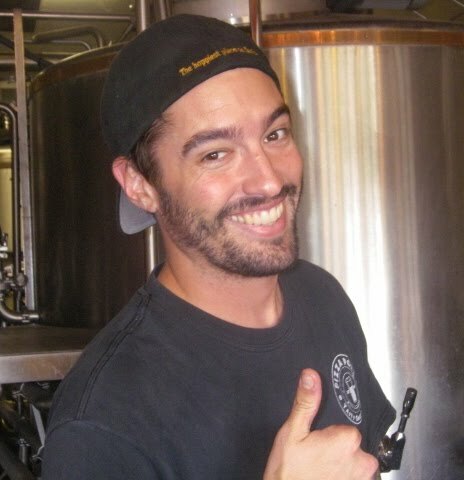 Noah’s also the 2010 GABF Small Brewpub Brewer of the Year. But you wouldn’t know that sitting at the bar. No placards. No framed trophy shots. Not even a grease pencil shout-out on the dry-erase board. In fact, when I brought up the golden moment, the startled customers at the bar erupted in jubilation. They knew they were in the presence of greatness, but they didn’t know just how great. What’s next for the 27 year old Small Brewpub Brewer of the Year? “Right now I’m just focused on my customers,” forlornly noting that due to size limitations (a 15 bbl system) he hasn’t been able to quench the thirst of his faithful flock who’ve been patiently waiting for his Pseudo and Doheny Double IPAs the last few weeks. Pizza Port San Clemente doesn’t bottle and doesn’t intend to in the foreseeable future, which doesn’t seem to bother Noah a bit. Noah uses about 5 pounds of hop pellets per barrel in his IPAs. In the past three years he’s seen his volume increase from 400 barrels in 2007 to 700 barrels in 2009. This year he anticipates 800 barrels and is about maxed out. What’s Noah looking for in hops? Like most, he never thought much about how or whether the design of a pellet influences the flavor and aroma. Like most, when ordering, he never specified the size of a pellet, nor the grind. Like most, he assumed that pellets were pellets and his suppliers must know what they’re doing. I brought a few pellets from our 2009 Oregon Goldings supply and Noah trotted out the same variety from his supplier and we did the “plop plop fizz fizz test,” dropping an equal amount in cups of hot water and room temperature. On contact, our hops floated and expanded before settling, while the others dropped to the bottom much faster, where the tiny hop particles quickly formed a silt bank. After watching the pellets behave in their respective cups, I asked our champion for his candid, unvarnished opinions. “I’d do it like that,” Noah said without hesitation, pointing to the cup of Indie Hops’ blooming green tea. There was nothing “dazed or confused” about that answer. “I want that,” Noah intoned, as in a trance, again pointing to the IH concoction. Can a gold medal winning brew get better? We think so. Congratulations to Noah and Pizza Port, which, when you factor in the Carlsbad pub brewery, racked up a jaw dropping 9 medals at the 2010 GABF. Noah’s real-deal “Pseudo” IPA will be tapped, if all goes well, in about two weeks (artistic creation doesn’t obey deadlines). Mark your calendar and get there early and stay late – I’ve got a feeling Noah’s fan club is about to break out.